Every home has to have a working furnace if residents are going to stay warm during the coldest parts of the year. Not having this equipment is incredibly unsafe. This is why it is vital for all property owners to know how to maintain their heating systems, when to have them fixed, and when to have them replaced. 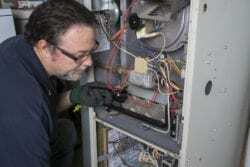 Do you need furnace repair in Roselle IL? The only way to be absolutely sure is by connecting with the professionals at ARIA Heating & Cooling LLC. You should always have a relationship with a good HVAC contractor in Roselle. This way, you can have routine maintenance performed twice yearly. These visits are not costly and they can wind up saving you hundreds of dollars over time. HVAC equipment that is properly maintained is far more efficient than machinery that is not. Moreover, these units are going to enjoy full lifespans. When you take care of your heater, you won’t have to worry about it breaking down early. These visits additionally give the professionals at ARIA Heating & Cooling LLC the best ability to identify small problems and to take care of these before they have the chance to turn into something much larger. This way, you can keep your repair costs under control. People generally spend a lot less fixing problems with their heating equipment when these issues are identified and resolved early on. It is important to determine whether or not your system needs to be fixed or replaced. If this unit has become increasingly inefficient throughout the years and is nearing the end of its lifespan, paying for a replacement is probably best. A newer and more efficient unit will perform reliably and will cut your energy spending all-around. You may need to install a system that is better able to meet the demands of your home. Some forms of existing construction have furnaces that are not properly sized. Over time, the costs of running poorly sized equipment can become astronomical. It is far better to have ARIA Heating & Cooling LLC come in and assess your home heating needs. Then you can get recommendations for a replacement that actually suits the demands of the building. People often think that loud, ticking noises and dry dusty smells indicate serious problems. Some furnaces are simply noisy. Regular cleaning and maintenance will eliminate most unpleasant aromas. When in doubt, however, you should always reach out to a reputable provider in your area. Call ARIA Heating & Cooling LLC at 630-433-0339 today for a free estimate! and at ARIA Heating & Cooling LLC, we have the experience and craftsmanship to handle your needs.